In trying to understand Boba Fett in “Star Wars: Episode II – Attack of the Clones”, one cannot get over trying to figure out his clone-father, Jango Fett. Thus, I wanted to explore Jango Fett in this theatrical presentation. Our first introduction to Jango Fett is on Coruscant, where he has been tasked with the assassination of Senator Amidala and subcontracts the job to Zam Wesell. As the end of the second job has gone south and Zam is about to divulge who hired Zam to carry out the job, Zam is shot by a poisonous dart by Fett. 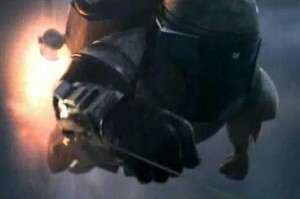 This shows that Fett – despite having any particular relationship to this colleague – is willing to instantly kill Zam. It’s not clear whether Fett had a great sense of hearing to detect that Zam was about to divulge Fett’s identity or had simply noticed that the Jedi had confronted Zam and was concerned that Zam might divulge said information. Either way, Fett chose to end Zam at that point. He thinks he is so great, so why not have another of himself? While this list is not exhaustive, it is curious that he did make this his sole request. 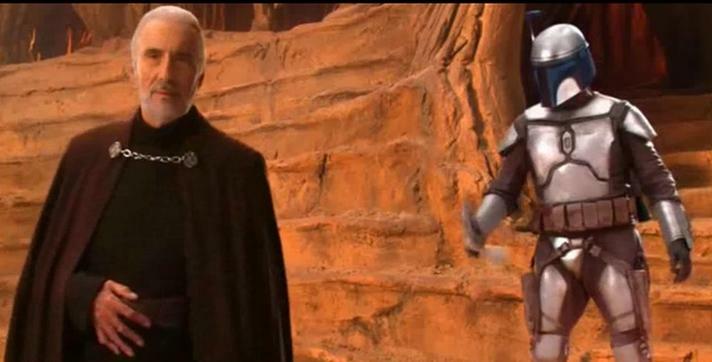 When Obi-Wan Kenobi queries him concerning his hiring, he states that he “was recruited by a man called Tyranus on one of the moons of Bogden.” It is interesting that he lies about his recent visit to Coruscant, yet tells him the truth about his employment…. Nevertheless, he is very confident about his clones – they’ll do their job. 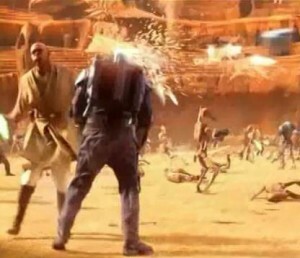 He does realize that the Jedi are after him and he orders Boba to “Pack your things; we’re leaving.” When they are about to depart and see Obi-Wan Kenobi approaching, Jango immediately begins shooting at him. 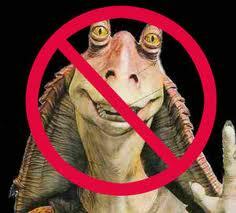 He clearly understands that he is not to be taken by the Jedi and to flee as quickly as possible. In the course of fighting him, he has lots of weaponry: a pistol, a rocket from his backpack, a rope, and, at the end, some sort of metallic stuff that allows him to stay on the side of the platform and not to fall. 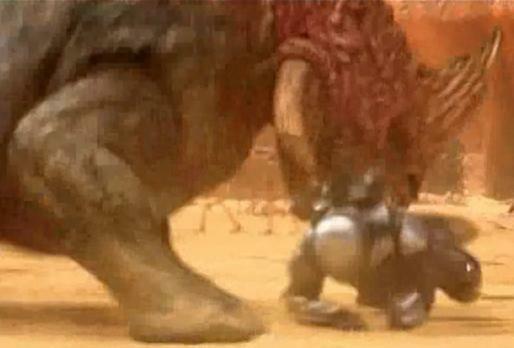 After he and Boba arrive outside of Geonosis and Boba points out to him that they’re being followed, he says, “We’ll move into the asteroid field and we’ll have a couple of surprises for him”, indicating that he is a good pilot and can easily survive an asteroid field. His surprises for Obi-Wan primarily consist of seismic charges, although eventually he fires some sort of tracking missile, which hits something and explodes. After Kenobi’s ship disappears from his scanners, he confidently celebrates by saying, “Well, we won’t be seeing him again.” Amusingly, the tactic of hiding behind a large asteroid is something that Boba Fett will use in “The Empire Strikes Back”. 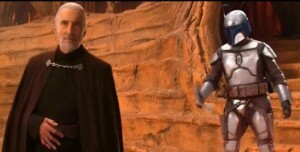 The next time we see Jango Fett is at the arena on Geonosis, where he appears to be a kind of bodyguard for Count Dooku and, when Mace Windu initially appears, immediately threatens Jango Fett. 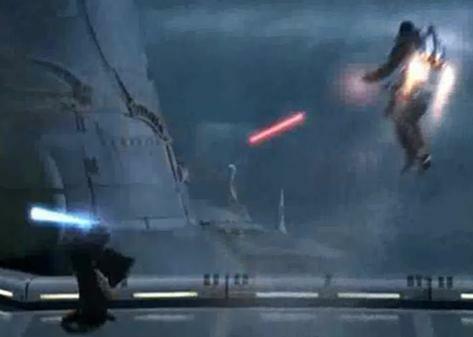 However, Fett is able to shoot off some fire at Windu, causing Windu to descend to the arena floor. 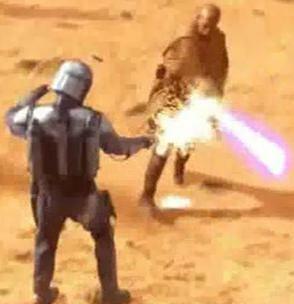 Later on in the battle, Jedi Master Coleman Trebor comes after Count Dooku to kill him, but Jango Fett is there to shoot him dead. He then spins his pistol into his holster, like he’s in the wild west! Towards the end of the battle, when Fett spots Windu in some trouble with the reek, he decides to use his jetpack to go after him (even though he could have stayed up in the VIP box). However, he then gets trampled by the reek. Nevertheless, he turns around and shoots the reek dead. Then, Mace Windu comes after him, while Fett is shooting his blaster at him to no avail, until Fett is beheaded. Thus, Jango Fett only ever appears in just this one movie on-screen.